Completion of an Ironman triathlon results in muscle damage, indicated by reductions in muscle function and muscle soreness. However, the time course of recovery from this damage has received little attention. 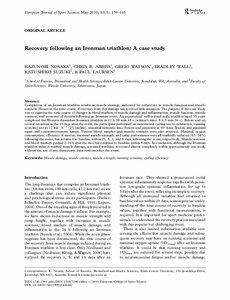 The purpose of this case study was to examine the time course of changes in blood markers of muscle damage and inflammation, muscle function, muscle soreness, and economy of motion following an Ironman event. An experienced well-trained male triathlete aged 35 years completed the Western Australian Ironman triathlon in 11 h 38 min 41 s (winner's time: 8 h 3 min 56 s). Before and on several occasions in the 15 days after the event, the participant performed an incremental cycling test to exhaustion, running economy test at 12 km.h-1 (2% incline), maximal isometric knee flexion and extension at 90° knee flexion, and maximal squat and countermovement jumps. Venous blood samples and muscle soreness were also assessed. Maximal oxygen consumption, efficiency of motion, maximal muscle strength, and jump performance were all markedly reduced (4.5-54%) following the event, but returned to baseline within 15, 8, 2, and 8 days following the event, respectively. Muscle soreness and blood markers peaked 2-24 h after the race but returned to baseline within 8 days. In conclusion, although the Ironman triathlon induces marked muscle damage, a trained triathlete recovered almost completely within approximately one week, without the use of any therapeutic interventions after the event.